Can the offense win with Anthony Brown, or will it need to win in spite of him? In 2017, BC finished in the middle of the pack offensively, averaging 25.5 points per game in conference. Eliminating Georgia Tech from the equation (the Yellow Jackets almost exclusively run on offense), BC ranked second in conference rushing but last in conference passing. The running game should be no problem with the return of AJ Dillon and Phil Steele’s 6th-best offensive line in the nation, but Anthony Brown’s arm remains a concern. Brown threw 7 interceptions in his first 4 collegiate games before settling down and only throwing 2 over his next 6. Brown’s average passer rating was a just-ok 105 for the season. Yes, he must improve, and he will. His season-ending leg injury prevented crucial developmental time with the offense, but 10 starters return on that side of the ball to provide familiarity, and a favorable early-season schedule will allow the offense to make up for time lost at the end of last season. Brown will also need to stake his claim as BC’s QB before Sam Johnson arrives on the Heights in 2019, which should light an additional fire under the sophomore. While he does have to make strides this season, he doesn’t have to be great, just good enough. Brown only needs to open up the passing game enough to give opposing defenses an extra aspect to think about besides Dillon. If defenses respect the passing game, more room will open up for Dillon to run wild. BC compares very favorably to Stanford, a team that finished 9-3 in the regular season in 2017 and projects as a favorite in the Pac 12 in 2018. The Cardinal possess an all-world running back in Bryce Love and a phenomenal offensive line. Quarterback KJ Costello completed only 124 of 211 passes (58.8%) for 1,573 yards in 2017. Compare that with Brown who completed 134 of 258 passes (51.9%) for 1,367 yards. Obviously Stanford benefits from a weaker Pac 12, but with a similar team around him, Brown doesn’t need to improve much for BC to go from 7-5 to 9-3. Will the defensive unit be a strength in 2018? The Boston College defense finished 2017 allowing 22.8 points per game, which was 6th best in the ACC. The mark was a considerable improvement from the 2016 season, during which the Eagles conceded 25.0 points per game. Although the Eagles return only 6 starters from 2017, the significant amount of injuries sustained by the 2017 starting unit provided valuable in-game experience to several underclassmen that project as 2018 starters. Among those underclassmen forced into the field of play in 2017 due to injury were MLB John Lamot, who finished 5th on the team in both tackles (63) and tackles for loss (4), and DE Wyatt Ray, who tied for 3rd on the team in sacks (2.5). These new (yet proven) faces will join forces with potential 2018 All-Americans Zach Allen, Lukas Denis, and Will Harris to form an elite defense that could be one of Steve Addazio’s best at BC. Although great excitement and promise resides with this year’s defense, the answers to two important questions will have a major effect on the overall performance of this 2018 unit. Firstly, while potential All-American safeties Lukas Denis and Will Harris will do their best to keep the pass defense airtight, much will rest on BC’s two inexperienced corners, junior Hamp Cheevers and redshirt freshman Tate Haynes. Cheevers and Haynes will be tasked with replacing Isaac Yiadom and Kamrin Moore, each of which had productive 2017 campaigns in the cornerback position at BC and were drafted to NFL squads after the season. Secondly, how will the interior of the defensive line respond in 2018 after being manhandled against good competition? In early season games against Notre Dame and Clemson, BC conceded 515 and 342 rush yards on defense, respectively. In 2018, the Eagles will return its bruiser nose-tackle Ray Smith, but will face elite rushing offenses in Clemson, Florida State, and Miami (FL). Will the Eagles be able to shut those rush offenses down? Can AJ Dillon really win the Heisman? 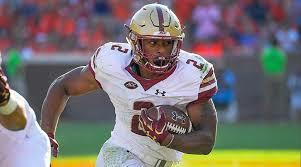 Boston College has been unable to push past a 7-5 regular season record in Steve Addazio’s tenure in Chestnut Hill, but this projects to be his most talented team yet. It wouldn’t be all that surprising to see the Eagles wrap up the 2018 regular season at 8-4 or even 9-3. Double-digit wins might be a stretch, but it’s certainly a possibility. Why does all of this matter when talking about AJ Dillon’s Heisman chances? Because since 1969, only Lamar Jackson has won the Heisman on a team that lost 4+ regular season games. But that was a historic season for Jackson (he became the only Heisman winner to ever rush for 1000 yards and pass for 3000 yards in a season) on a Cardinals team that did go 7-1 in conference play including a 63-20 stomping of then #2 Florida State. So, regardless of Dillon’s individual performance, BC will have to win some more games if he wants any shot at the Heisman. This season does, however, set up favorably for Dillon for a few reasons. First is the surprise effect which could inflate Dillon’s value. BC is one of the more underrated programs in the nation and Dillon isn’t getting much love because of that. A lot of the national media has the Eagles rights around .500. Maybe a 9-3 season helps Dillon more than, say, a guy like Bryce Love who plays for a team that is expected to go 9-3. Conversely, if Dillon has an excellent season but the team as a whole doesn’t live up to expectations, record may not matter as much this season. Dillon’s competition for the trophy is likely to include Justin Herbert, Will Grier, Trace McSorely, Bryce Love, and Khalil Tate, all of whom play on teams that may finish with a record no better than BC’s. Many of college football’s elite this season are built on defense, think Clemson’s D-line and DE Nick Bosa, which wins championships but rarely Heismans. The schedule is in Dillon’s favor as well, with the Eagles opening with 7 very winnable games where Dillon can establish himself as one of the nation’s best. Once Dillon becomes a household name, the brutal four-game stretch late in the season will put all eyes on him and his “Heisman moment”. Then he can finish up by running wild over Syracuse for a good final impression. How difficult will the road be for the Eagles in 2018? A year after enduring a schedule that included a non-conference meeting with Notre Dame and an ACC cross-division matchup against Virginia Tech, the road becomes no easier for the Boston College Eagles. In 2018, BC will face a slate of opponents that had combined record of 89-64 last season. After opening the season against two inferior regional opponents in UMass and Holy Cross, Boston College will travel to Wake Forest for a Thursday evening encounter, and will effectively begin a 10 game stretch in which the Eagles will either be slight favorites or underdogs in each game that it plays. Following its first ACC matchup against Wake Forest, BC will travel to Big Ten opponent Purdue and will host upstart American Athletic Conference opponent Temple before continuing its ACC schedule by traveling to NC State and then hosting Louisville. After its bye week, the much-discussed, 4-game gauntlet for the Boston College Eagles begins. In a 4-week span, BC will face arguably the four best teams that the Atlantic Coastal Conference has to offer in Miami (FL), Virginia Tech, Clemson, and Florida State. These four teams finished with a combined record of 38-15 last season with one team (Clemson) qualifying for the 2018 College Football Playoff and three (Clemson, Miami, and VT) earning places in the final AP Top 25 poll. If Steve Addazio and company want to eclipse the 7-win mark that they settled for in each of the previous two seasons, they will most likely need to pull an upset in at least one of these four difficult games. After undergoing this four game gauntlet, BC will host rival Syracuse in the final game of the regular season. In last year’s rivalry week matchup at the Carrier Dome, the BC offense amassed a season-high 581 yards on offense (333 yds rushing, 248 yds passing) as the Eagles toppled the Orange, 42-14. Will the special teams unit take a step forward or backwards? In 2016, then-sophomore K Colton Lichtenberg was able to beat out then-junior K/P Mike Knoll for the placekicking duties on special teams. Yet, after going 0-2 FGs in his first game against Georgia Tech, Coach Addazio decided to return the placekicking duties to Knoll, who in limited action the season before was 2-3 FGs and 9-9 PATs. Knoll was relatively successful after resuming his role as the placekicker in 2016 (12-14 FG, Long of 40 yds, 27-30 PATs), but would be once again challenged by Lichtenberg for the starting position on the 2017 squad. With Knoll entering his senior season in 2017, it came as a surprise to many when Colton Lichtenberg was announced as the starting placekicker. Even though Lichtenberg was able to retain his starting role all throughout the season, he disappointed much like he had in that 2016 season opener in Ireland against GT. Lichtenberg converted on only 12 of his 20 field goal attempts, with a long of 42 yards. Meanwhile, as the starting punter, Mike Knoll was largely successful, to the extent that he earned a spot on ESPN’s Midseason All-America team. Now, in 2018, Boston College will be left with a kicker in Lichtenberg that has yet to show signs of competency at the collegiate level and a massive hole at the punter position. Will Lichtenberg be able to win over Coach Addazio again in 2018 camp or will newcomer John Tessitore spoil Lichtenberg’s senior season? If Boston College has its eyes set on an 8+ win season, efficiency from its starting kicker is critical. On the punting front, it is unknown at this point as to who will trot out with the starting unit against UMass on September 1st, but sophomore P Grant Carlson and freshman K Dan Longman could be names vying for the position in camp. Regardless, filling the void left by the highly efficient Knoll will be difficult. The Present on the Heights is Bright, but Will the Opening of the Fish Field House Make the Future Brighter? On July 25th of this year, the Fish Field House, a $52.6 million, 115,700 square-foot facility that will serve as indoor practice space for BC football as well as for other varsity sports teams, was unveiled to the media. The indoor field at the Fish Field House is equipped with a playing surface that exactly replicates the playing surface of Alumni Stadium, video cameras that will be used to capture the action from practice, and a 31-feet wide and 18-feet high video board. Athletic Director Martin Jarmond, addressing the magnificence of the facility, explained, “This new addition will help BC football and all of our coaches in their recruitment efforts, and put BC on par with the other ACC schools, all of which have made similar investments in indoor facilities.” In terms of recruitment efforts, has the opening of the Fish Field House already made an impact? According to 247Sports, Boston College has already seen an uptick in recruiting, although it is still relatively early in the class of 2019 recruiting period. BC’s 2019 recruiting class ranks 40th nationally and 10th in the ACC, up from its 2018 recruiting class rankings of 69th nationally and 14th in the ACC. The 2019 recruiting class is currently headlined by pro-style QB Sam Johnson III, who like current BC star RB A.J. Dillon, turned down an offer from the University of Michigan in favor of Boston College. Overall, as of August, the 2019 recruiting class contains 15 players with an average rating of 0.8570, according to 247Sports, which is up from an average rating of 0.8365 from the 2018 recruiting class. While, as we previously mentioned, it is still early in the 2019 recruiting period, the Fish Field House seems to be making a significant impact on the recruiting front for Boston College. Who will emerge as the top draft-eligible QB? Compared to the 2018 quarterback class which yielded 5 first round picks, including four top-10 selections, the 2019 class will not generate as much buzz. While the 2019 crop lacks definitive top-end talent, it more than makes up for it with incredible depth. As of now, there is no consensus as to who will be the first QB off the board next April, with a dozen, if not more, QBs vying for that title. One option is Mizzou’s Drew Lock who led the nation with 44 touchdowns in 2017. Eighteen of those, however, came in three games against poor competition; Lock will need to prove he can hang tough against high-end competition. Oregon’s Justin Herbert and West Virginia’s Will Grier are two guys who’ve struggled to stay on the field (for vastly different reasons), but have been electric in their limited playing time. Jarrett Stidham, who has been compared to Derek Carr, and Ryan Finley, an intelligent pro-style QB with arguably the highest floor of anyone in the class, are two dark-horse options as well. Other outsiders who may not go first but speak to the incredible depth of the class are: Trace McSorley, Jake Browning, Khalil Tate, Clayton Thorson, Shea Patterson, Nick Fitzgerald, Daniel Jones, Jake Bentley, Brett Rypien, and McKenzie Milton. Will traditional ACC powerhouse Florida State rebound from an uncharacteristically poor 2017 season? Entering last season as the #3 team in nation, Florida State traveled to the Mercedes-Benz Stadium in Atlanta, GA to take on #1 Alabama in one of the most highly anticipated opening-week matchups in college football history. Trailing the Crimson Tide 24-7 in the fourth quarter, FSU QB Deondre Francois suffered a left knee injury that would later be diagnosed as a torn patella tendon, effectively ending the QB’s 2017 campaign. Lacking depth beyond Francois, the starting QB duties were handed over to true freshman James Blackman. Despite significant help from true freshman RB Cam Akers, who broke the FSU freshman record for most rushing yards, and sophomore RB Jacques Patrick (748 yds rushing, 5.6 YPC), the inexperienced Blackman could only lead the Seminoles to a mediocre 7-6 record. To cap off the Seminoles’ forgettable 2017 campaign, longtime head coach Jimbo Fisher resigned his position at Florida State in the offseason and signed on to become the head coach of Texas A&M on a 10 year, $75 million contract. Now, with new HC Willie Taggart, the Seminoles are ready to put the disappointment of the 2017 season (and offseason) behind them. In 2018, FSU will return its starting QB in Deondre Francois, who led the Seminoles to a 10-3 season in 2016 that concluded with an Orange Bowl victory over Michigan, and its exciting duo of running backs in Cam Akers and Jacques Patrick. The combination of Francois, Akers, and Patrick gives the Seminoles one of the nation’s best young backfields and a lot for fans to be excited about. Even though the defensive side of the ball is still in rebuild mode, it has enough speed and overall athleticism to compete with upper-echelon ACC offenses. With both sides of the ball oozing with young talent, this Seminoles squad will certainly return to relevance in 2018, and a home matchup against Clemson on October 27th may be the deciding factor as to which team will be wearing the ACC Atlantic crown in December. Can Jim Harbaugh and Michigan finally live up to expectations? Despite a 28-11 record in his three-year tenure, Jim Harbaugh has not brought the Wolverines to the level most had expected upon his arrival in Ann Arbor. In his first season, Harbaugh took Michigan from unranked to #12. And in 2017, Michigan reached #2 in the nation late in the season. Yet, they’ve only reached one New Year’s Six bowl and are a combined 1-5 against rivals Michigan State and Ohio State. This year could be different, however, as Harbaugh has his best quarterback yet in Ole Miss transfer Shea Patterson. Patterson led the SEC with 2,259 passing yards before tearing his PCL against LSU in late October. That’s more than Michigan’s QB trio threw for combined all season in 2017. He should also be surrounded by much better talent than the Rebels gave him, although he’ll miss standout wide receiver AJ Brown. On the other side of the ball, Michigan is stacked with a potential #1 pick in 2019 in DE Rashan Gary. The Wolverines also boast the best cornerback duo in the nation in juniors Lavert Hill and David Long. Hill boasts a 38.4 passer rating when targeted, good for 12th lowest among returning CBs. Long tops that with a minuscule 11.9 passer rating when targeted, the best of any returning CB. With the off-field turmoil surrounding Ohio State, there is no reason not to believe that this can be Michigan’s year to finally take the next step in the Big Ten. Who will be this year’s UCF? Did UCF’s 13-0 season last year open the door for a non-power 5 team to secure a playoff berth? In all likelihood, probably not, as the perfect season, including an upset over an Auburn team that had defeated both the eventual National Champion and runner-up, only got the Knights as high as #6 in the final poll. Regardless, it certainly will give the selection committee pause if another UCF rolls around in the future. It may be a cop-out, but this year’s UCF could very well be UCF. The Knights lost a lot on defense, and head coach Scott Frost left for Nebraska. Still, UCF returns Heisman candidate McKenzie Milton, and the program has a chip on its shoulder to defend its claimed national championship. Of all the group of five schools, Boise State probably has the talent, schedule, and reputation to represent the teams in a New Year’s Six game. Another candidate is Florida Atlantic. After going 1-3 in their first four, Lane Kiffin’s Owls finished the season on a 10-game win streak that included only one single-digit win. Outside of QB, they have just about the best everything in Conference USA. And, of the three teams, the Owls have the best opportunity for a statement win, with a week one showdown against Oklahoma. Boise State can carve its own path, but UCF and FAU do square off in a Friday night game September 21st.